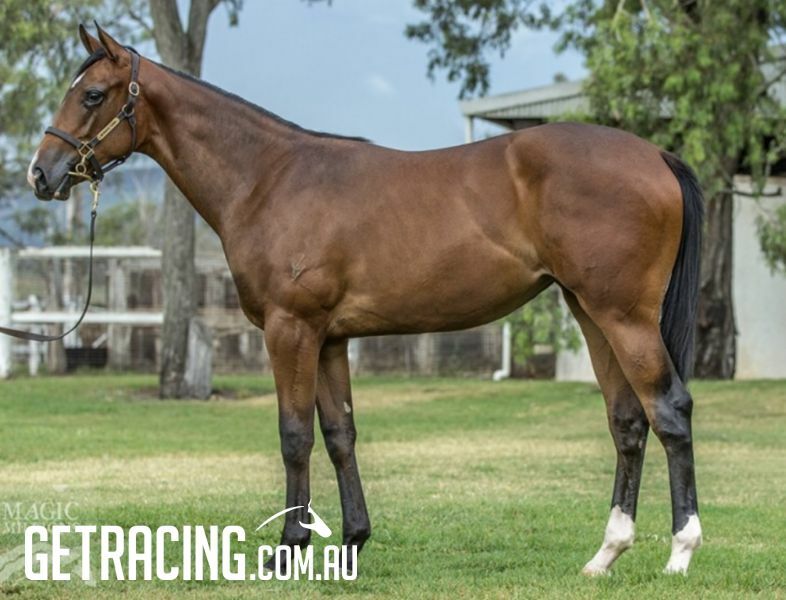 We have secured lot 1085 from the Magic Millions Gold Coast Sale, this stunning filly by outstanding sire Smart Missile. Smart Missile is one of the hottest sires in Australia right now, and this season alone sits at an incredible 39.6% runners to winners, siring 77 individual winners of 113 races worth over $4,000,000 (as at 17/01/19). So far, the best progeny of Smart Missile have been fillies, including the Group 1 winner Maid of Heaven, and the highly talented stakes winner Smart Melody. This filly will hold great residual value, being the first foal out of a Show a Heart mare, She's A Sweetheart, who is a half sister to the outstanding colt Lean Mean Machine. Lean Mean Machine has already won two Group 2 races, and was third in a hot Group 1 Coolmore Stakes behind Sunlight and Zousain. There would be a substantial pedigree update for our filly if Lean Mean Machine can step up and win a Group 1 this Autumn. Our Filly has an already impressive page, with grandam She's Meaner a stakes winner, who is a half sister to consistent sire Love Conquers All. She will be trained by Joe Pride at Warwick Farm. Joe and Tricolours currently have a 100% runners to winners strike rate, and we are delighted to have her as part of the team. Increase your chances of owning a winner, and join our winning combination! Shares are available in the following sizes and include purchase price including GST, 12 months insurance, Magic Millions race series, registration costs, Golden Slipper nomination, BOBS payment, all vet and bloodstock inspection costs, sale costs, breaking in, Agistment, transport (interstate) and all syndication costs and ALL costs up until April 2019. SHE'S A SWEETHEART, by Show a Heart. Unraced. Half-sister to LEAN MEAN MACHINE. This is her first living foal. LEAN MEAN MACHINE (c Zoustar) 3 wins-2 at 2-to 1350m, A$456,544, to 2018-19, ATC Run to the Rose H., Gr.2, BRC Sires' Produce S., Gr.2, ATC Pluck at Vinery 2YO H., 3d VRC Coolmore Stud S., Gr.1, ATC Kindergarten S., Gr.3, GCTC Ken Russell Memorial Classic, Gr.3. Smart Devil (g Smart Missile) 2 wins at 1200m, 3d Qld Tatt's RC Carlton Mid H.
LOVE CONQUERS ALL (c Mossman) 8 wins to 1400m, A$1,380,000, ATC Shorts H., Gr.2, AJC Missile S., Gr.3, MRC Betfair S., Gr.3, AJC June S., L, City Tatt's RC Brian Crowley S., L, AJC Randwick's 150th Anniversary H., Linesman H., Victory Vein P., 2d ATC Doncaster H., Gr.1, George Ryder S., Gr.1, BRC Doomben Ten Thousand S., Gr.1, ATC Canterbury S., Gr.2, STC Expressway S., Gr.2, 3d ATC Premiere S., Gr.2, GCTC Magic Millions 3YO Trophy, RL, 4th MVRC Manikato S., Gr.1. Sire. SHE'S MEANER (f Falvelon) 3 wins. See above. She's Bella (f Sebring) Winner at 1000m, 2d ATC Australian Turf Club 2YO P., 3d ATC Reginald Allen H., L, Bishop Kevin Manning 2YO P., Australian Turf Club 2YO H.
Gatakers Bay. 4 wins to 1400m, A$85,600, BTC Frantelle H., QTC JM Gray-Buchanan H., 2d BTC Men of League Foundation P., 3d BTC Airen Youhanna the Good Guys H.
Pegapus. 5 wins-1 at 2-from 1200m to 2000m, A$81,680, to 2018-19, BRC Glenlogan Park 2YO P., Brc.com.au H., Ipswich TC Ray White H.
SHE'S A MEANIE (f Prince Salieri) 7 wins. See above. Palemo. 5 wins from 2100m to 4800m, NZ$122,312, A$35,600, Hawke's Bay S/chase, Waikato S/chase, 2d Oakbank RC Great Eastern S/chase, 3d Wellington S/chase. Copper Flame. 4 wins at 1200m, 1400m, WRC Central Forklifts H., Sparkes Walker H., 2d Manawatu RC Lion Red H., WRC Lion Brown H.-twice, 3d Manawatu RC Ezibuy H. Producer. Browne Sugar (f Don Eduardo) 4 wins from 1200m to 2100m, 3d CJC Spring Classic, L, Blue Star Taxis H., Win a Ford Focus H.
SAXONVALE (c Centaine) 9 wins to 1400m, NZ$84,200, Woodville-Pahiatua RC WFA Sprint S., L, Manawatu RC Pak 'n Save H., WRC Industrial Distributors H., Hutt Valley Cartage Improvers H., Tyre General Michelin Improvers H., 3d WRC Telegraph H., Gr.1. MERCURY MISTRESS (f No Excuse Needed) 5 wins from 1200m to 1600m, NZ$79,925, CJC Inglewood S., L, ARC Ernst & Young H., Jesters Pies H., Counties RC Waitakere Corporate H.